This hand-thrown design draws on the significance of true love's unbroken journey. Pass the poetry, please. Bryan Becker's hand-thrown design draws on the significance of a circle as a symbol of true love's unbroken journey. 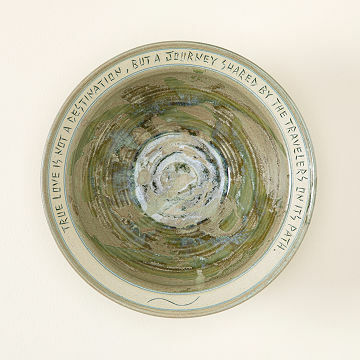 The beautifully glazed stoneware server bears the poetic inscription, "True love is not a destination, but a journey shared by the travelers on its path." High-fired to withstand the rigors of microwave, dishwasher, and oven use, it makes a great wedding or anniversary gift. Handmade in Hartland, Wisconsin. Given as a gift. It is being used as a fruit bowl. Great looking bowl my wife loves hand made and looks personalized. Your spouse will love this gift AND I was astonished at my kids' reaction. They really loved the bowl and want to use it at all our meals. It was awesome for our kids to see our expression of love for one another at every meal we have together. Bought as an anniversary gift for very good friends. It arrived promptly but the note that I had written with the order was not included. They liked the bowl very much and I was pleased except they did not know who sent it at first and my note was not included at all. I find this happens a lot with gift orders and for a gift ii is particularly important that your thoughts are there with the gift. They go together. I think a focus on that part of the order process would be beneficial to your company and certainly to your customers. The bowl is used everyday in the kitchen to hold fruit.